InLoox PM 7 clearly defines project budget by planned and actual expenses and revenues in minimum time. 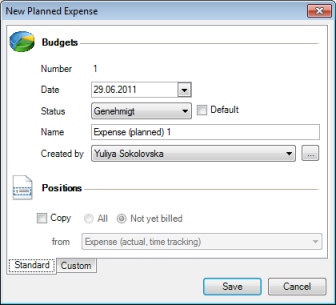 InLoox PM 7 provides following budget types as plan revenues, plan expenses, actual revenues and actual expenses. A budget has a status and usually contains positions. For more information see Create and edit a budget position in the Copy positions from the existing budget documents section. How to set and edit a project budget | InLoox PM 7 • Copyright 1999-2019 © InLoox, Inc. All rights reserved.